Can I deposit in Aussie dollars? Yes you can. I’m depositing now, how does the bonus work? It’s automatic and in your account immediately as soon as you deposit. I've won $500AUD and clicked on withdraw, when can I expect my cash? Your withdrawal is being processed and will be with you within 24hrs. Registering as a new member at Fly Casino is quick and easy, simply go to Fly Casino and click on Download or Play Instantly you will then be asked if you would like to register a few simple details including the currency you would like to play in. As soon as you've entered a few basic details, clicking Create Account will complete your registration process and you’ll be given a username allowing you to login with your chosen password. Once logged into the casino you'll find yourself in the casino lobby, at this point you'll have the option of going to the cashier to make your first deposit which will then trigger your automatic 110% bonus. Fly Casino continuously provides blackjack promotions to its members which are based on the game variant being played. Fly Casino members receive promotions via e-mail and are often invited to fortnightly blackjack tournaments which offer generous prize pools to its winners. 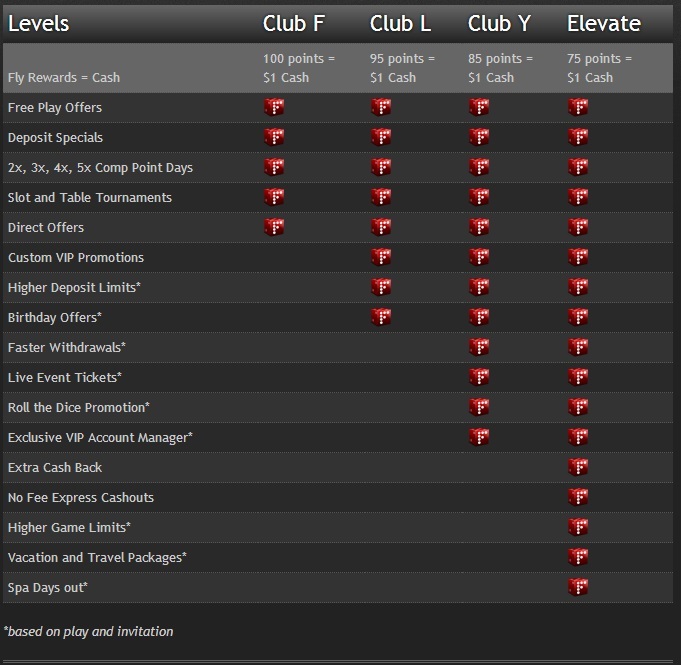 As well as tailored ongoing member promotions Fly Casino also has its VIP Rewards program which is open to all members. Similar to most reward programs, Fly Casino offers its members cashback, private tournaments, higher level comp points, and express cash outs, even travel packages and evenings out. Members fit into 4 different categories depending on overall wagers made during real money sessions. Win or lose a point is awarded for every $10 AUD wagered. The higher level, Club L, Club Y or Elevate the more cash rewards you’ll receive. Members can choose from 4 different blackjack variants, all games are smooth and without interruption. Players are able to turn on or mute background music. Each player is prompted to place a bet at the start of a hand, chips range from 0.1, 0.5, $1, $5 $10, $25, or $100. Players can also view their gaming history or change the game settings by clicking on the tool icon in the top right hand corner. Games offered are: •	Regular Blackjack •	Blackjack Switch •	Perfect Blackjack •	Blackjack Surrender Fly Casino employees the use of Playtech software which is the worlds leader of gaming software this enables Fly Casino to offer the state of the art graphics and sound. Fly Casino offers 24hr, 7 days a week professional live chat support as well as e-mail and telephone support. E-mail and telephone support information can be found within the casino lobby as well as on the website. To conclude, Fly Casino recently launched early last year and is already fast becoming a top tier online casino. Our opinion is Fly Casino is far superior to many other online casinos who offer blackjack. The fact they have a huge focus on customer service and accept deposits and process withdrawals in our Aussie dollars quickly and efficiently has won us over.